The Kok tobe mountain and Television tower, placed on this mountain by right can be considered the largest landmarks of Almaty. The name of mountain is translated from Kazakh language as “Blue Hill”. Its height is 1130 meters above sea level. And in order to reach the top of it you can use the serpentine highway, or aerial cableway. During the lifting on aerial cableway the panorama of the entire city and the snowy mountain range of Alatau is opened before passengers, and the TV-Tower, which seems high as it is, at approach to it becomes more massive. 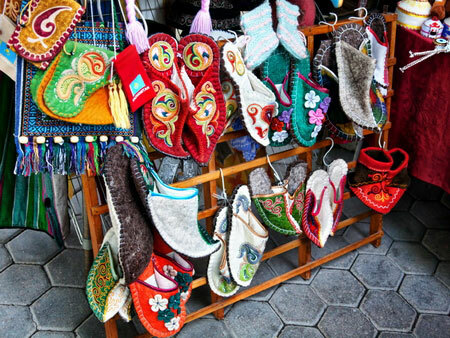 There is the observation deck and few cafes with Kazakh national cuisine on the hill. A foot descent from the mountains during the day, for many will seem a very pleasant walking. At night, the beautiful landscape of lights of night city can be seen from the observation deck of Kok-Tube mountain. 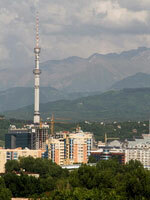 A little aside, there is the well-known Almaty TV tower with the height of 372 meters. 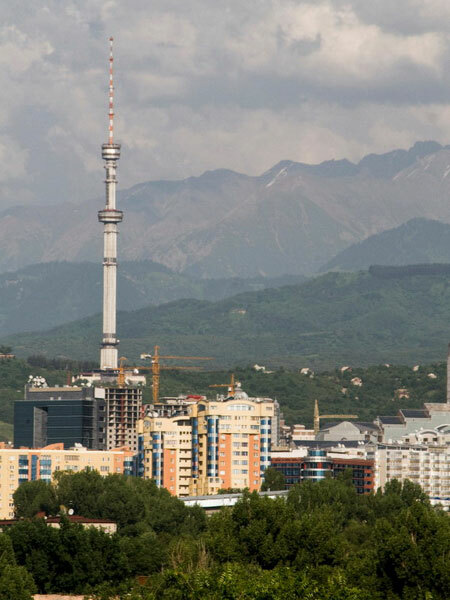 Of course, today some of skyscrapers and towers are constantly striving to kilometric altitude, but Almaty TV-Tower also has its undisputed advantages: it is the highest tower above sea level, the only high-rise tower built in earthquake-prone area and capable to withstand an 10 magnitude earthquake. At night, the television tower is illuminated by powerful projectors, so that it can be seen from any end of the city. It is worth to note, that on the TV tower there is no observation deck for tourists yet, but the work on creation of such sightseeing area on the TV tower is underway. In addition, on the observation deck of Kok-Tube mountain there is the unusual monument - the first on the territory of former Soviet monument to the group The Beatles. A few years ago major work on the restoration and improvement of parkland were carried out on the mountain, and now it is the modern and beloved by all residents of the city place of rest.